Using the appropriate methods on these classes, you can build the database model manually, or you read it from XML or from the database (see the next paragraphs for details). More info about the classes can be found in the javadoc. Changing a database essentially means one of two things: resetting a database to the schema defined by the model, or altering the database to have the same model. The key difference is that with the latter, data in the database is retained as much as possible. Only major changes to the table structure or type-incompatible alterations of columns will result in loss of data, most changes will simply retain the data. Whether a change of e.g. 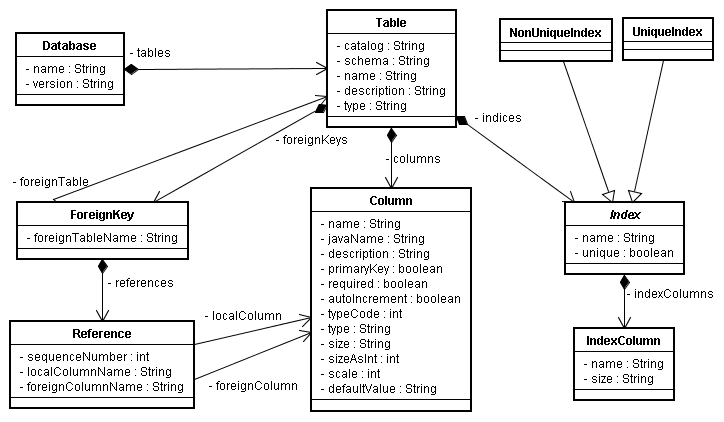 a column type affects the data contained in the table, depends on the database that you use. Most databases are able to convert between different datatypes and will apply these conversions when the column type is changed. Databases like Oracle allow for more than one separate schema in one database. To cater for these databases, there are variants of these methods where you can specify the catalog and schema. // "name" and "whatever" are columns of table "author"
In the same way as inserting data into a database, DdlUtils uses dyna beans for retrieving data from the database. You issue a SQL select against the database and get dyna beans back. This means that the table that the select goes against, has to be part of the database model used by DdlUtils. First, we specified so-called query hints in the call to the query. Query hints are an array of tables whose columns are used by the query statement. The reason why they should be used is that not all databases provide sufficient information in the JDBC result set object to determine the table to which a column belongs to. Since this info is need by DdlUtils to properly extract the value and convert it to the corresponding Java type, it is safer to specify these hints. What DdlUtils does in this case, is to search for a column of that name within the specified tables and use the mapping for this column. This of course can fail if you use aliases in the query statement (and the JDBC driver handles them in a strange way), or if more than one table has a column of this name. But in most cases you'll get the expected results.